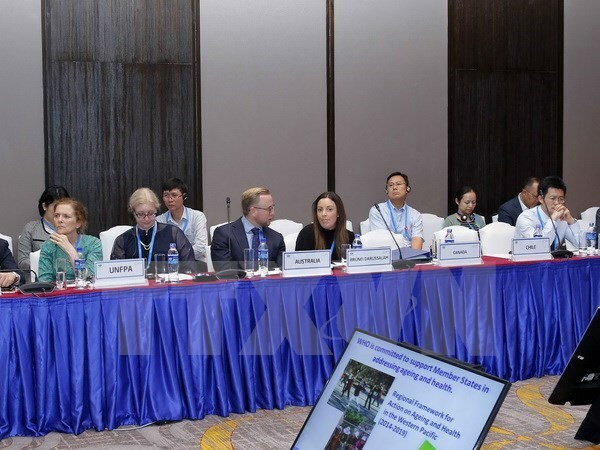 HCM City (VNA) – Delegates attending the 7th High-Level Meeting on Health and the Economy which took place in Ho Chi Minh City on August 23-24 held that the event is important to member economies of the Asia-Pacific Economic Cooperation (APEC) forum. James Smith-Plenderleith, Regional Director for Communication and Public Affairs of Janssen Asia Pacific, told Vietnam News Agency reporters that the meeting provided an opportunity to discuss progress in implementing APEC’s Healthy Asia Pacific 2020 programme, which calls upon regional economies to develop sustainable and high performing health systems by adopting or adapting “health in all policies” to enhance people’s health and wellbeing. “We approve a number of programmes in support of a Healthy Asia Pacific 2020 and today I had an opportunity to share our experience in developing public private partnerships in the areas of HIV, Ebola, tuberculosis and mental health,” he said. The 7th APEC High Level Meeting on Health and the Economy was an important summit, bringing together health and finance experts, as well as organisations in the public and private sectors, he said. “Over the last two days, we heard many examples of how economies are developing innovative ways to finance and strengthen health systems, particularly in regards to community healthcare. Mental healthcare is a great example of this and where terrific progress has been made in launching an APEC Digital Hub on Mental Health, addressing illnesses that affect an average 20 percent of the working-age population, as well as productivity, the economy and both personal and public finances,” he noted. James Smith-Plenderleith said Janssen, part of the Johnson & Johnson Family of Companies, is proud to support the APEC Digital Hub on Mental Health and the broader ambitions of the APEC Healthy Asia Pacific 2020 programme. “The Vietnam organising board should be very proud of their role in supporting such an important dialogue, which has further strengthened regional efforts to advance the health and economic prosperity of economies across the region,” he stressed. Lokky Wai, WHO Chief Representative in Vietnam, said it is very timely to have this meeting because many of the APEC economies are in the middle income status and economic growth needs healthy people. Leonita P. Gorgolon, a delegate from the Philippines, said the meeting creates a venue where APEC economies shared experience in using medical resources effectively. He highlighted Vietnam’s all-people health insurance model and Japan’s mobilisation of social resources for the sector.